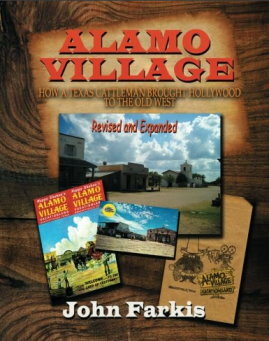 Updated from its first edition in 2005, Alamo Village has been greatly expanded with detailed information, fascinating insights, interesting interviews and numerous photographs about the important Texas film site." Amazon: "Not Thinkin'... Just Rememberin'..." is a tour de force. This manuscript is very thorough and exhaustively researched. Mr. Farkis is an adept writer. He knows his subject extremely well. His knowledge is intensive and extensive. "True West Magazine, Stuart Rosenbrook:"... the definitive book on the making of the classic Western..."Texas Monthly, Stephen Harrigan: "Not Thinkin' ... Just Rememberin'..." is all about (I mean all about -- it's 900 pages long) Wayne's obsessive quest to direct his 1960 epic The Alamo." 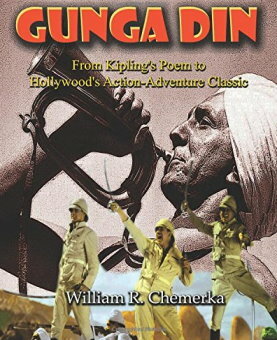 William R. Chemerka carefully traces the history and legacy of one of Hollywood's most memorable films in Gunga Din: From Kipling's Poem to Hollywood's Action-Adventure Classic. The book's superbly detailed research is augmented with dozens of images, some of which are published for the first time. Click on this link for a 3D preview of the disc and artwork! The CD is officially sold out - and thanks to all who supported the project! We're at the gift shop signing CD's... And happy to report that sales jumped 300%!! 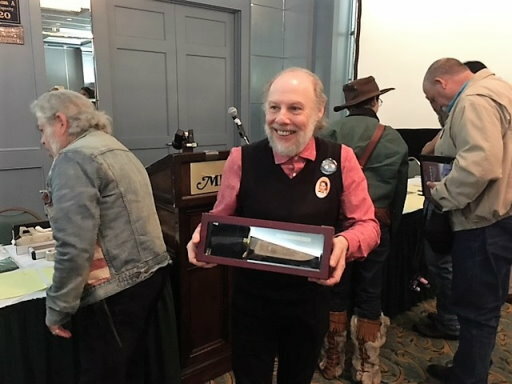 "I was honored by the Alamo Society for the many years of doing graphic design for THE ALAMO JOURNAL with a presentation Bowie Knife." Thank you Bill Chemerka and Chris Nolan! In 2015 two members of the Alamo Society, Mike Boldt and Glenn Effler, decided to make a 3 part video about the Battle of the Alamo, the present condition of Alamo Plaza and the hope of what it could become in the future. With contributions from Gary Foreman, Gary Zaboly and Ron Adair. 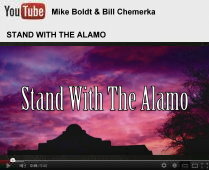 Mike Boldt, a musician, retired teacher and Alamo enthusiast, composed, performed and recorded "Stand With the Alamo," a song intended to rally support for improvements in the area around the Texas shrine. Boldt, of New Jersey, is a retired special education teacher. William R. Chemerka of New Jersey wrote the lyrics of “Stand With the Alamo,” a song intended to rally support for improvements in the area around the Texas shrine. He is a former high school history teacher. For the first time since 1836, Alamo Plaza may once again become a place of historical importance. For those who wish to see the Alamo's actual footprint restored to a place free of inappropriate commercialism, it's time to STAND WITH THE ALAMO! Two die-hard Alamo buffs, former teachers living in New Jersey, have created what they said may be the key to elevating the Texas shrine to its full potential: a catchy new theme song. 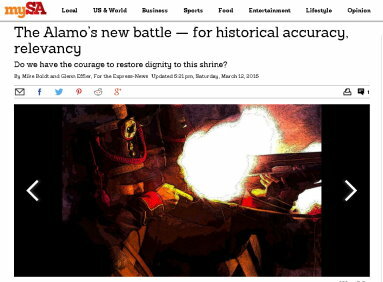 In the wake of metal rock idol Ozzy Osbourne’s conciliatory visit last week to the mission and battle site downtown, Alamo advocates William R. Chemerka and Mike Boldt are promoting their song, “Stand With the Alamo,” to rally support for upgrades to the area. Both are members of the Alamo Society, a group of about 500 Alamophiles in the United States and 10 foreign nations, some gathering here each year for the anniversary of the battle on March 6, 1836. “I always feel there’s a karma to things. They happen when they’re supposed to happen,” said Boldt, a musician and retired special ed teacher in Weehawken, New Jersey. Boldt called Chemerka, who lives in nearby Barnegat, and told him about two weeks ago to “send me some lyrics” about the need to upgrade Alamo Plaza, to provide more reverence and a moving historical experience. “He got the words to me in an email within 10 minutes,” said Boldt, who recorded a CD of songs about the Alamo, “Victory or Death,” in 2012. “It’s time to bring back all the long lost beauty; And a sense of history,” the lyrics declare, echoing sentiments of local and state officials now leading an effort to refurbish the state-owned Alamo complex and improve the surrounding area. The state and city already have committed more than $45 million in public funds for the Alamo area, including the pending purchase of three buildings now leased as amusement attractions in the plaza, and for projects recommended by a master plan for the area, to be completed next summer. Also engaged in the plan is the nonprofit Alamo Endowment, which has projected up to $300 million may be needed to return the area to its full glory, with new pavement, pedestrian access, public art, a museum and partial reconstruction of the 1836 mission-fortress compound. Famed musician Phil Collins has donated $15 million in artifacts to advance a bigger vision for the Alamo. Chemerka, who founded the Alamo Society in 1986, said he copyrighted the song but will permit its open Internet use to aid the cause. He said he would like to see it recorded by a major country artist, to become a fundraising theme song. Members of his group created a video with the song on YouTube. A possible state song for the Garden State? You know what we need in New Jersey??? How about a state song? Have I got a state song for you! Could it be the new state song? "LIVIN' IT UP IN NEW JERSEY"
New on the Music Scene! Produced by Eric Zaccar and Sophia Ziburtovicz, this mood altering CD contains the work of platinum record winning Spin Doctors front man, Chris Barron, Broadway composer Barbara Anselmi, and award winning film scorer, Mike Boldt. Other contributing artists include Carolynn Black, Willy Chu, Cathy DaPrato, Kevin Jones, Jensen Keets, Kama Linden, Elizabeth Nicholas-Synnott, and James Raddock. Along with several musical tributes to fallen firemen, this powerful collection is filled with songs of hope, anger, fear, sorrow, pain, betrayal, shock, unity and love. Click on the CD to listen to the show! May Pang shares her years of life experience in the music business, as well as the time she spent with John Lennon, the Beatles, and many other legendary musicians. May is also an author, pop-asian culture webzine publisher and Feng Shui jewelry designer. May's co-host, Cynthia Neilson, is a writer as well as a former stuntwoman and casting director. standing in front of the Reynold Brown painting from the film, 'THE ALAMO ' . William R. Chemerka brings the untold story of General Joseph Warren Revere's gothic adventures to life in this detailed biography of the grandson of the legendary Paul Revere. Published by BearManor Media, it is a "must" for every historian's bookshelf. 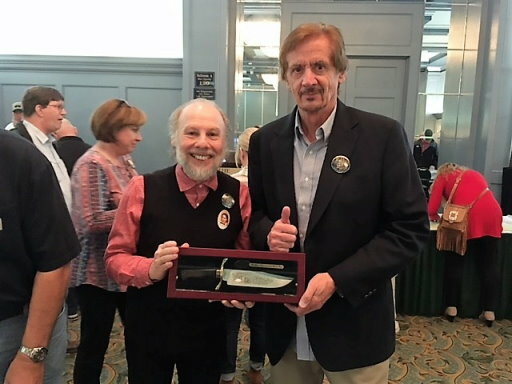 At the 2015 Alamo Society Symposium at the Menger Hotel Mike Harris debuted a one of a kind print of his latest Alamo model. (see photo). Mike is happy to announce that this 11x17 print is now available to all at the price of $30.00 and $5.00 postage and handling. All prints will be signed and numbered by Mike Harris. Bad weather forced us off The Perch and into ERNIE"S BAR at the Crockett Hotel. It seemed fitting that since we all spent so much time there, Ernie's should have its own song. You can now download the CD from Amazon and iTunes! Union City has an official song. The song, 'Union City', composed by Mike Boldt and Phil Gallo, was adopted by resolution as the city’s official song at the Board of Commissioners meeting last Wednesday. A recording of the tune was performed by the group Dez Manku, which features both Boldt and Gallo. An accompanying music video was produced and edited by Mauro De Trizio for Action Productions. The song "WEST OF THE WIRE" was written in tribute to the brave men who fought in World War l . This August marks the centennial of this event. An event that changed the course of human history forever. This song is featured in the newest collection of songs by Dez Manku called LORDS OF THE ZONE. Available on iTunes and Amazon. This is the FULL VERSION of the song "TRANSFER STATION" by Dez Manku written by Mike Boldt and Phil Gallo. It shows the "Station" back in 1969 and what it all looks like today. It's a bit sad but it was a time to remember. This song is featured in the newest collection of songs by Dez Manku called LORDS OF THE ZONE. Available on iTunes and Amazon. Also, check out June Ponte's great painting of Transfer Station . "UNION CITY" is Dez Manku's special salute to Union City, New Jersey. It was impossible to put every land mark in Union City in the song, but we did our best to get as many in there as we could. It's Part 1 of our "HUDSON COUNTY TRILOGY". Stay tuned for Parts 2 and 3 - "TRANSFER STATION" and "BLVD. EAST". We hope you enjoy it, and it brings back some great memories. Celebrated every June, the prestigious Union City Artist Awards honor the most talented and dedicated artists from all disciplines who have contributed to Union City's artistic fabric. What makes this award so special is that it celebrates and accentuates an individual artist’s distinguished artistic career and his or hers many accomplishments. In March of 2014, Joan Headley put together an incredible ALAMO-OSCAR party in San Antonio, Texas. It was my very good fortune to perform the song "THAT'S OUR JOAN" and receive a "Joanie" for my efforts. So here, along with K.R.Wood and Bill Chemerka is a bit of that wonderful evening. Mike Boldt has written songs that have appeared on Columbia and Capitol Records and has recorded two solo albums, "James Bond and Beyond" and "Tribute to John Wayne's The Alamo". He recently won a Telly Award for Best Music Score for the DVD, "At the Alamo". 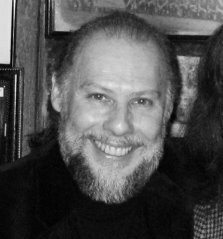 Phil Gallo has done numerous soundtracks including the feature film, "Mother's Day" with Clem Vicari. This collaboration operated under the name "Sleight of Hand" which eventually led to other soundtrack projects including a few parody commercials for "Saturday Night Live". 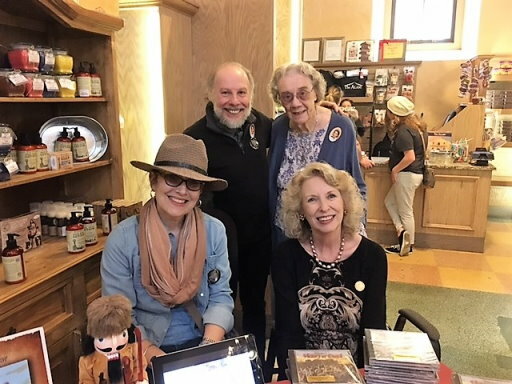 Nancy and I met some wonderful people on our visit to The Alamo in San Antonio, Texas this past March. While sitting at "The Perch," we had the pleasure to meet Mo Jones his wife Gill and their daughter Charlotte from Wales. Since then, Mo and I have corresponded frequently, and I promised him I would write a song for Charlotte. So here it is, Sgt. Major Jones. I hope this brings back wonderful memories of your trip to Texas and The Alamo. By the way, this may be the only song ever written with the word "Wayneamo" in it. About two weeks ago I posted a rough version of "The Perch" to YouTube. This new one is the "Master" version. I wanted to name a bunch of people in this description but realized that there were far too many for me to thank so please accept this song as a "THANK YOU" to all the wonderful people that Nancy and I met at the Perch. and all the folks who posted some of the photos I used to fill in some spaces and Phil Gallo from DEZ MANKU for some fine guitar work and sweetening. This song is dedicated to a good friend from the Jersey days, JoAnn Lovas. is available on iTunes and Amazon [simply type in DEZ MANKU]. WELCOME TO THE BIG TIME is the latest release from Mike Boldt and Phil Gallo, better known as DEZ MANKU. After the success of their first CD, FEAR AND LOVE, Dez Manku has taken an exciting turn with this new set of songs. They have invited a few guests to help them navigate the musical maze. 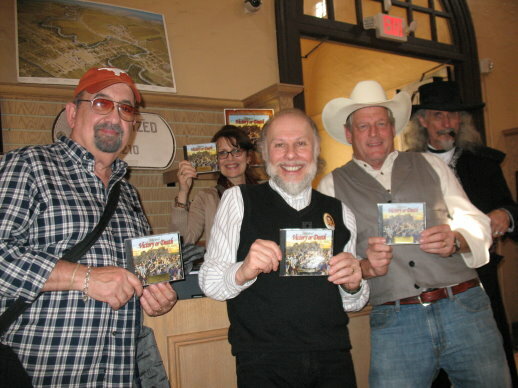 "Skinny Rider" features the vocal talents of Joseph and Sandy Selph and James and Cosundra Camp. 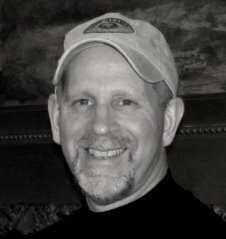 Writer, actor Bill Chemerka is featured playing bass guitar on both "Skinny Rider" and "Gravity" as well as handling the recitation on "Everybody's Doin' It." "Dez Manku" is the creation of Mike Boldt and Phil Gallo. Their first musical endeavor goes back to 1998 when they both worked on the music score for the hard hitting film, "West New York" directed by Phil Gallo. The feature starred Frank Vincent and Vincent Pastore, veteran actors from Martin Scorcese's "Goodfellas" and "The Sopranos". They connected musically again in 2005 for the score of "Mattie Fresno and the Holoflux Universe". Throughout both projects they kept discussing writing and performing together in a non-film genre. Shortly after "Mattie..." they decided to finally begin composing, then recording a collection of songs. The recording, tentatively titled "The Mike Phil Project", began to take shape. After about seven months of work, the album was completed. They decided to name the group Dez Manku and the collection became "Fear and Love". FEAR AND LOVE is available for download on iTunes and Amazon. The Telly Awards honor the very best local, regional, and cable television commercials and programs, as well as the finest video and film productions, and work created for the Web. Since 1978, their mission has been to strengthen the visual arts community by inspiring, promoting, and supporting creativity. The 28th Annual Telly Awards received 14,000 + entries from 50 states and 5 continents! Congratulations to Mike Boldt in New Jersey, USA!